Ways of Being, Ways of Reading is a collection of essays that address biblical interpretation and the Bible's role in Asian North America. The essayists in this volume represent a cross-section of the work formally being done in the area of biblical studies. Contributors to this volume have been trained in the multiple disciplines that constitute the field and represent a range of religious affiliations (including, but not limited to Christian tradition). The key issues and themes are: cultural hermeneutics, the politics of identity and what constitutes Asian American theology, among others. 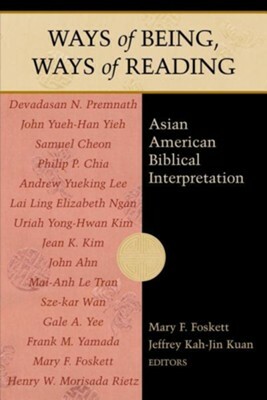 I'm the author/artist and I want to review Ways of Being, Ways of Reading: Asian American Biblical Interpretation.